The circuit above illustrates how to connect the components together. 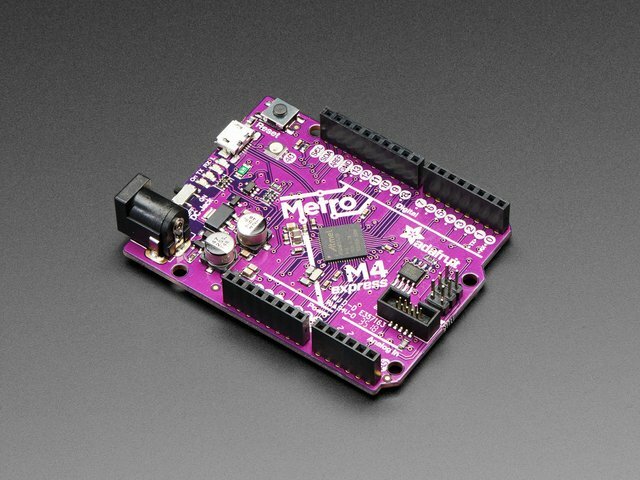 You should prototype the circuit before soldering wires to the Gemma. 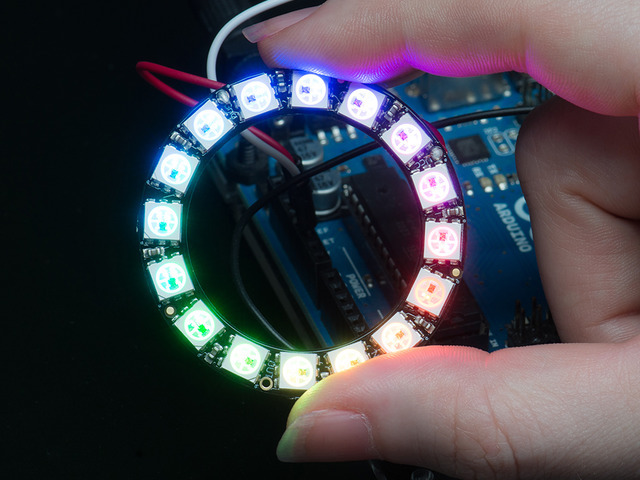 The NeoPixel ring and Mic sensor will be connected to the Gemma. Connect three alligator clips to the NeoPixel Ring pins labeled, GND, DIN, and 5V. These three alligator clips need to connect to the Gemma. GND on of the NeoPixel connects to GND pin of the Gemma. 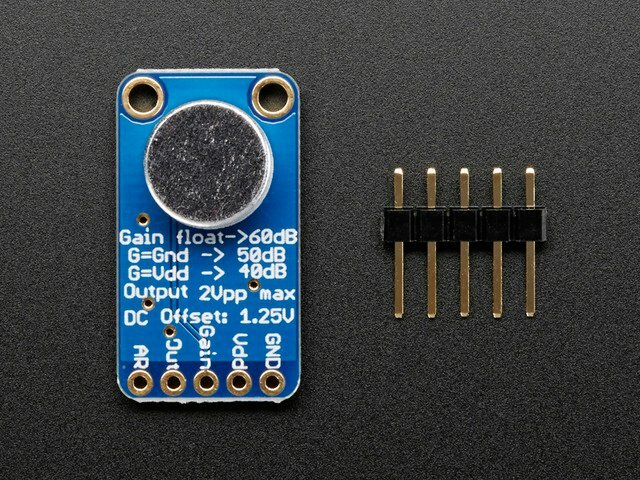 DIN pin of the NeoPixel connects to the D1 pin of the Gemma. 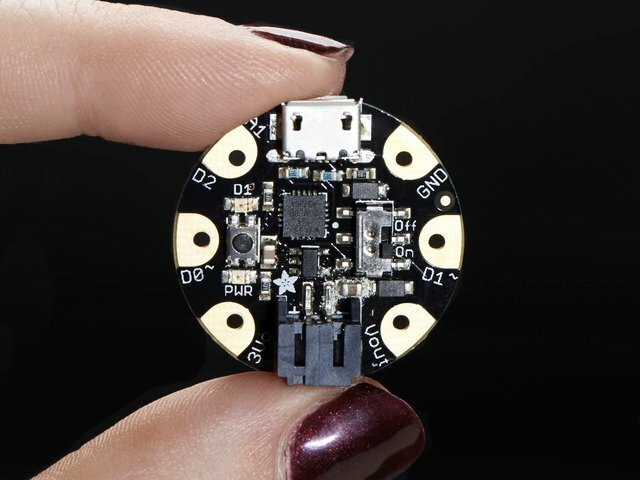 5V on the NeoPixel connects to the vbat pin of the Gemma. The mic sensor will also need three alligator clips. VCC of the mic sensor goes to 3v on the Gemma. The out pin on the mic goes to A1/D2 on the Gemma. GND of the mic sensor will shares the GND connected to the Gemma. The mic has an adjustable gain. On the back of the mic PCB, there's a tiny screw that you can adjust to lower or increase the sensitivity of the input gain. Please take consideration when using alligator clips. If the circuit isn't working, double check the connections on the NeoPixel ring and the mic sensor. They have tiny pins and can often be difficult to alligator clip. 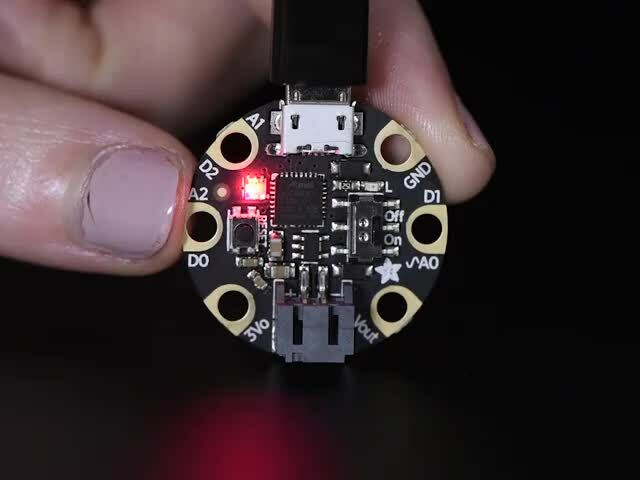 If the prototype is too flakey, try soldering jumper wires to the pins of the NeoPixel ring and the mic sensor and then alligator clipping them to the Gemma. First we need to measure the length of 20 gage wires. These wires are pretty thin. The minimum length of these wires should be around 60mm (2.3in). This should be long enough to position each component separately from each other but short enough not to clutter the inside of the frame. Cut and strip 6 pieces of wire (3 for the mic sensor and 3 for the NeoPixel ring). We've found the soldering process is a bit easier if you solder the wires to the NeoPixel Ring and mic sensor first, and then those wires to the Gemma. You can tin your connections by adding small amounts of solder to the pins. 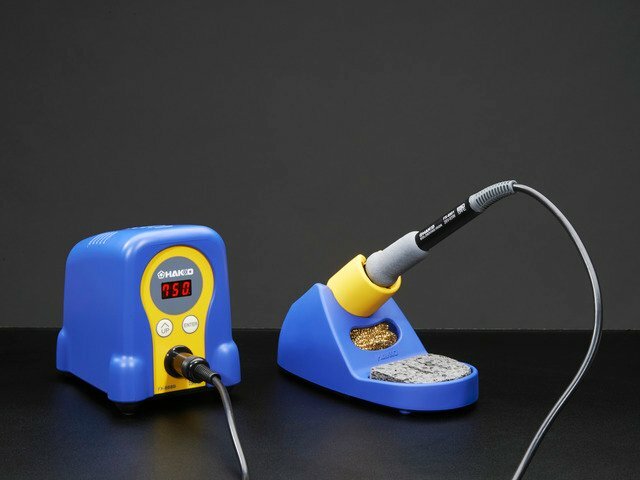 You can use a handy tool to hold your components while you solder. Since the NeoPixel Ring is mounted to the bottom cover, you'd get better lighting quality if you solder the wires coming from the back of the NeoPixel ring PCB. 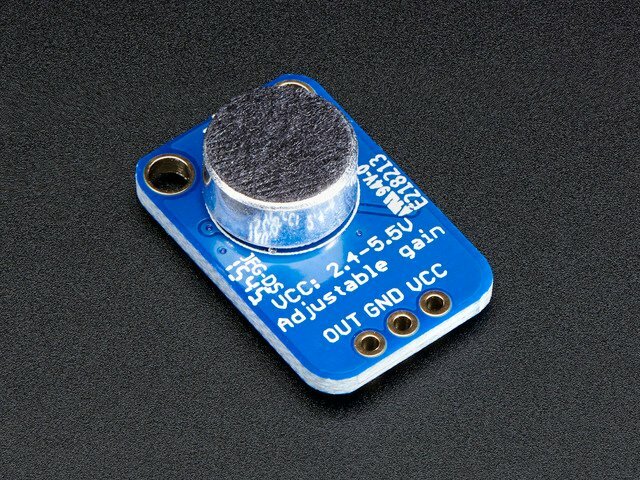 The mic sensor can have the wires soldered to the front of the PCB. Once the mic sensor and NeoPixel ring have the wires securely soldered, use the handy tool to hold the components and solder them to the Gemma. The mic sensor and neopixel ring are going to share the ground GND pin on the Gemma. 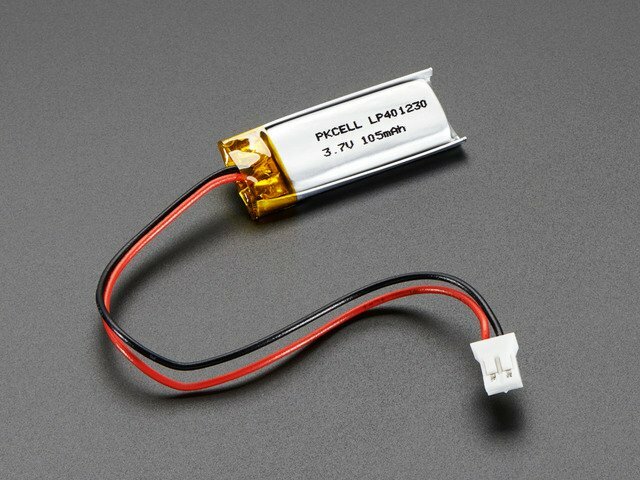 The slide switch needs to be connected to the lithium polymer battery so that the circuit can easily be powered on and off. To do this, first cut the RED wire connect of the lithium polymer battery. Now you will need to solder and connect one end of the red wire to the middle and left (or right) pin of the slide switch. See our circuit diagram to get a better visual idea. Please be very careful when you do this! Try hard not to pull out the wires from the battery and never let the red and black wires touch! With the power circuit assembled, plug in the lithium recharage battery to the JST port of the Gemma. Slide the switch and it should power on! This guide was first published on Dec 20, 2013. It was last updated on Dec 20, 2013. This page (Circuit Diagram) was last updated on Apr 24, 2019.